Island Robert Nesta Marley, OM (6 February 1945 – 11 May 1981) was a Jamaican singer-songwriter who became an international musical and cultural icon, blending mostly reggae, ska, and rocksteady in his compositions. He started in 1963 with the group the Wailers and forged a distinctive songwriting and vocal style that became popular with audiences worldwide. The Wailers released some of the earliest reggae records with producer Lee "Scratch" Perry. The Wailers disbanded in 1974, and Marley pursued a solo career upon his relocation to England which culminated in the release of the album Exodus in 1977, which established his worldwide reputation and elevated his status as one of the world's best-selling artists of all time, with sales of more than 75 million records. Exodus stayed on the British album charts for 56 consecutive weeks and included the UK hit singles "Exodus", "Waiting in Vain", "Jamming", and "One Love". In 1978, he released the album Kaya, which included the hit singles "Is This Love" and "Satisfy My Soul". The greatest hits album Legend was released in 1984, three years after Marley died. It subsequently became the best-selling reggae album of all time. 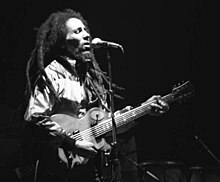 The Wailers disbanded in 1974, and Marley pursued a solo career upon his relocation to England which culminated in the release of the album Exodus in 1977, which established his worldwide reputation and elevated his status as one of the world's best-selling artists of all time, with sales of more than 75 million records. Exodus stayed on the British album charts for 56 consecutive weeks and included the UK hit singles "Exodus", "Waiting in Vain", "Jamming", and "One Love". In 1978, he released the album Kaya, which included the hit singles "Is This Love" and "Satisfy My Soul". The greatest hits album Legend was released in 1984, three years after Marley died. It subsequently became the best-selling reggae album of all time. 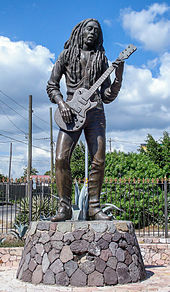 Marley died on 11 May 1981 in Miami at age 36 of melanoma. He was a committed Rastafari who infused his music with a sense of spirituality. 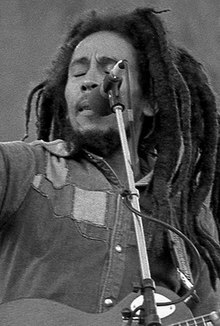 :242 He is credited with popularising reggae music around the world and served as a symbol of Jamaican culture and identity. He has become a global symbol and has inspired a significant merchandise industry. Shortly afterward, Marley's health deteriorated as his cancer had spread throughout his body. The rest of the tour was canceled and Marley sought treatment at the Bavarian clinic of Josef Issels, where he received an alternative cancer treatment called Issels treatment partly based on avoidance of certain foods, drinks, and other substances. After fighting his cancer without success for eight months Marley boarded a plane for his home in Jamaica. ↑ "7 Fascinating Facts About Bob Marley". Retrieved 10 October 2017. ↑ Samuels, A. J. "Bob Marley: Anatomy of an Icon". Retrieved 10 October 2017. ↑ "'Marley' - a new view of a cultural icon -". www.youthlinkjamaica.com. Archived from the original on 10 October 2017. Retrieved 10 October 2017. ↑ Toynbee, Jason (8 May 2013). Bob Marley: Herald of a Postcolonial World. John Wiley & Sons. pp. 1969–. ISBN 978-0-7456-5737-0. Retrieved 23 August 2013. ↑ Gooden, Lou (2003). Reggae Heritage: Jamaica's Music History, Culture & Politic. AuthorHouse. pp. 293–. ISBN 978-1-4107-8062-1. Retrieved 25 August 2013. ↑ Lee, Bunny (23 August 2013). "Interview". Reggae Vibes (Interview). Interviewed by Peter I. ↑ Barrett, Aston "Family Man" (19 February 2013). "Interview". Pure Guitar. Archived from the original on 6 December 2013. Retrieved 23 August 2013. ↑ Meschino, Patricia (6 October 2007). "'Exodus' Returns". Billboard. Nielsen Business Media, Inc. p. 42. ISSN 0006-2510. Retrieved 23 August 2013. ↑ Masouri, Jon (11 November 2009). Wailing Blues – The Story of Bob Marley's Wailers. Music Sales Group. ISBN 978-0-85712-035-9. Retrieved 7 September 2013. ↑ Soni, Varun. "Bob Marley's Spiritual Legacy". huffingtonpost.com. Retrieved 11 July 2017. ↑ Moskowitz, David (2007). Bob Marley: A Biography. Greenwood Publishing Group. p. 13. ISBN 978-0-313-33879-3. Retrieved 10 September 2013. ↑ Observer Reporter (13 April 2006). "Ziggy Marley to adopt Judaism?". The Jamaica Observer. Of further interest, Ziggy's grandfather Norval, is of Syrian-Jewish extraction... This was confirmed by Heather Marley, who is the daughter of Noel Marley, Norval's brother. ↑ Hombach, Jean-Pierre (2012). Bob Marley: The Father of Music. Lulu. p. 52. ISBN 9781471620454. ↑ Kenner, Rob (May 2006). "The Real Revolutionary". Vibe. Vibe Media Group. 14 (5): 118. ISSN 1070-4701. 1 2 Adams, Tim (8 April 2012). "Bob Marley: the regret that haunted his life". The Observer. ↑ Moskowitz, David (2007). Bob Marley: A Biography. Greenwood Publishing Group. p. 2. ISBN 978-0-313-33879-3. Retrieved 10 September 2013. ↑ Moskowitz, David (2007). Bob Marley: A Biography. Greenwood Publishing Group. p. 9. ISBN 978-0-313-33879-3. Retrieved 10 September 2013. ↑ Davis, Stephen (28 July 1983). Bob Marley: the biography. Littlehampton Book Services Ltd. ISBN 978-0213168599. ↑ "Stepney Primary and Junior High School". bobmarleyfoundationja.org. Bob Marley Foundation. 16 September 2009. Retrieved 1 September 2013. ↑ Marley, Bob (31 January 2012). Listen to Bob Marley: The Man, the Music, the Revolution. Open Road Media. pp. 65–. ISBN 978-1-4532-2494-6. Retrieved 1 September 2013. ↑ Moskowitz, David (2007). Bob Marley: A Biography. Greenwood Publishing Group. p. 4. ISBN 978-0-313-33879-3. Retrieved 10 September 2013. ↑ Wailer, Bunny (January 2011). "The Last Wailer – Bunny Wailer interview". GQ (Interview). Interviewed by John Jeremiah Sullivan. Retrieved 22 October 2013. ↑ Obrecht, Jas. 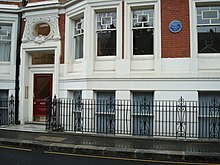 "Bob Marley's Early Years: From Nine Miles To London". JasObrecht.com. Retrieved 8 November 2013. ↑ Braithwaite, Junior (5 May 1985). "Interview". iration.com (Interview). Interviewed by Roger Steffens. Retrieved 7 November 2013. ↑ Foster, Chuck (12 November 2013). "Joe Higgs – No Man Could Stop The Source". Tiscali.co.uk. ↑ Pareles, Jon (22 December 1999). "Joe Higgs, 59, Reggae Performer; Taught a Generation of Singers". The New York Times. Retrieved 12 November 2013. ↑ Jeffrey, Don (16 July 1994). "Disputes Over Copyrights 'Scorch' Jamaican Reggae Artists". Billboard. Nielsen Business Media, Inc. p. 92. ISSN 0006-2510. ↑ "The Wailers' Biography". VitalSpot.com. Archived from the original on 10 September 2007. Retrieved 1 October 2009. ↑ Moskowitz, David (2007). The Words and Music of Bob Marley. Greenwood Publishing Group. p. 16. Retrieved 5 October 2016. ↑ "Reggae's Mad Scientist". Rolling Stone. Retrieved 2 December 2018. 1 2 Moskowitz, David (2007). The Words and Music of Bob Marley. Greenwood Publishing Group. p. 23. Retrieved 5 October 2016. ↑ Bradley, Lloyd (30 August 2001). Bass Culture: When Reggae Was King. Penguin Adult. pp. 522–. ISBN 978-0-14-023763-4. ↑ Campbell, Howard (22 March 2011). "Bunny Wailer sets the record straight". The Gleaner. Retrieved 8 November 2013. ↑ Williams, Richard. Catch a Fire. Catch a Fire (Liner notes) (2001 reissue ed.). ↑ Terry, George (June 2011). "Interview". Hit Channel (Interview). Retrieved 10 November 2013. ↑ "Billboard Hot 100 for week ending September 14, 1974". Billboard. Billboard Publications, Inc. 14 September 1974. p. 64. ISSN 0006-2510. ↑ "Bob Marley Biography". admin. 9 August 2010. Archived from the original on 26 April 2016. Retrieved 4 December 2016. ↑ "Billboard Hits of the World". Billboard. Billboard Publications, Inc. 15 November 1975. p. 69. ISSN 0006-2510. Retrieved 8 September 2013. ↑ "Soul". Billboard. Billboard Publications, Inc. 25 December 1976. p. 77. ISSN 0006-2510. Retrieved 2 September 2013. ↑ Moskowitz, David (2007). The Words and Music of Bob Marley. Greenwood Publishing Group. pp. 71–73. Retrieved 5 October 2016. 1 2 3 4 Henke, James (2006). Marley Legend: An Illustrated Life of Bob Marley. Tuff Gong Books. ISBN 0-8118-5036-6. ↑ Hans, Thobile (2 April 2015). "Remembering Bob Marley At The Birth Of Zimbabwe". Forbes. Retrieved 25 November 2018. ↑ Gooding, Cleland (11 April 2011). "A Death by Skin Cancer? The Bob Marley Story". The Tribune (Nassau). Archived from the original on 17 April 2011. Retrieved 26 July 2011. ↑ "Autopsy: The Last Hours of Bob Marley." Autopsy: The Last Hours of.... Nar. Eric Meyers. Exec. Prod. Ed Taylor and Michael Kelpie. Reelz, 25 February 2017. Television. ↑ "Bob Marley hired Gambino mobsters for protection in New York". New York Daily News. 8 July 2017. Retrieved 2 December 2018. ↑ "Bob Marley". BBC Religions. Retrieved 2 December 2018. ↑ "His story: The life and legacy of Bob Marley". BobMarley.com. Archived from the original on 17 April 2009. Retrieved 4 October 2009. ↑ Moskowitz, David (2007). The Words and Music of Bob Marley. Greenwood Publishing Group. p. 116. Retrieved 5 October 2016. ↑ Moskowitz, David (2007). Bob Marley: A Biography. Greenwood Publishing Group. p. 132. ISBN 978-0275989354. Retrieved 26 September 2013. ↑ "Grammy Lifetime Achievement Award for Bob Marley". Caribbean Today. 31 January 2001. Archived from the original on 12 May 2013. Retrieved 4 October 2009. ↑ "The Immortals: The First Fifty". Rolling Stone. Jann Wenner (946). Archived from the original on 6 January 2007. ↑ Plaque #4180 on Open Plaques, Retrieved 29 May 2017. ↑ Mooney, Jake (21 May 2006). "Drum Roll for a Sign With a Reggae Beat". The New York Times. Retrieved 11 October 2007. On May 10, the City Council approved a plan to hang Bob Marley Boulevard signs beneath the Church Avenue ones along an eight-block section, from Remsen Avenue to East 98th Street. ↑ "Brooklyn Street Renamed Bob Marley Boulevard". NY1. 2 July 2006. Retrieved 12 February 2018. ↑ Miller, Winter (17 February 2008). "Scorsese to make Marley documentary". Ireland On-Line. Archived from the original on 15 July 2012. Retrieved 6 March 2008. ↑ Jagernauth, Kevin (2 February 2011). "Kevin Macdonald Takes Over 'Marley' Doc From Jonathan Demme". indieWire. Archived from the original on 9 January 2012. Retrieved 22 February 2012. ↑ Downs, Elaine (23 June 2011). "Edinburgh International Film Festival 2011: Bob Marley – the Making of a Legend | News | Edinburgh | STV". Local.stv.tv. Archived from the original on 25 June 2011. Retrieved 26 July 2012. ↑ Davis, Stephen (July 28, 1983). Bob Marley: the biography. Littlehampton Book Services Ltd. ISBN 978-0213168599. ↑ Toynbee, Jason (2013). Bob Marley: Herald of a Postcolonial World. p. 88. Rita has claimed that she was raped there [Bull Bay] by Bob in 1973 after he returned from London, and asked her to care for another child he was going to have by a woman there (Roper 2004). The formulation changes to 'almost raped' in her autobiography (Marley 2005: 113). But in any event, it seems clear that Bob behaved in an oppressive way towards her, always providing financial support for herself and the children it is true, yet frequently humiliating and bullying her. 1 2 Paprocki, Sherry; Dolan, Sean. Bob Marley: Musician. p. 51. ↑ Moskowitz, David (2007). Bob Marley: A Biography. Greenwood Publishing Group. p. 15. ISBN 978-0-313-33879-3. Retrieved 10 September 2013.